Tag Archives: Eel River Brewing Co.
May 14th was a highly anticipated day for me and 4:00 couldn’t come soon enough. 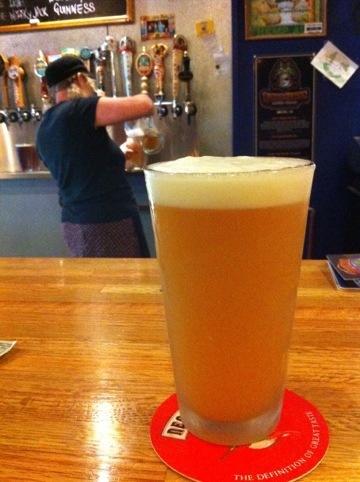 It was the earliest date and time to get a taste of Saison Du Humboldt and the only place to get it was Humboldt Brews. I staked my real estate claim at the bar just before 4PM and asked for a pint of Saison Du Humboldt. I was expecting to be told no because it wasn’t time yet. But the bartender happily obliged and the gentleman next to me, who I quickly named “Stranger #1” in my head, followed suit. Both were delivered at the same time and Stranger #1 asked, “Are you waiting until four?” I replied, “Hell no!” then we clinked glasses and drank. The keg had just arrived and didn’t have time to settle. So the pour was from a pitcher because it was too foamy. It was cloudy, and Saisons should be cloudy, but this was really cloudy, again due to the recent transport. The aroma I got was estery orange, some clove and a little banana. That’s all typical and it was what I was hoping for. There was a lot to think about in the taste. It was bright and lemony and a spice I couldn’t quite put my finger on but I learned later what that was. Saison, or farmhouse ale, has its origins in French Belgium and is meant to be brewed in such a way that it could last the warm summer months. This is all before common refrigeration and there was nothing special about it that “made it last” through the summer months –there were no more preservative ingredients than any other beer– but the typical ingredients found in a Saison gave some abilities in covering up some of the funk and twang that can come with an old beer that has been stored too warm for too long. (funny, we aim for that now with many styles!) Common Saison can have spices, acid malt, be phenolic and estery and are hopped a little bit more than usual in a Belgian beer. And all that varied based on the farmhouse. Each could bring not only their own recipe, but their own regional funk and method. So if all that geek speak goes over your head, just remember in the end its meant to be a refreshing quaff on a hot day and that’s all you need to know! Curious about the ABV, I asked the bartender if she could tell me anything about it. (this episode, and others like it are a continuing inquiry of mine and will be a later blog post) She couldn’t, but I don’t blame her for not being informed because it probably wasn’t shared. Her answer to my question was to pull off a piece of paper from the wall and hand it to me. “This is a write up”, she said and I was looking at my blog post that originally announced Saison Du Humboldt. And in all fairness, that was just a press release so I cheated on that one. In geek speak translation, the first two numbers you have to know to get the third, which tells us the alcohol content for the beer. The IBU is about what you would find in a pale ale and the last is a measurement on the color, which is very light. Your lesson is now over, go drink it. Continuing with an experiment I’ve been doing lately, I struck up a conversation with a total stranger. I’ve been getting amazing results and this was no different. Stranger #1 turned out to be Dan, who was the original artist for the Humboldt Brewery logo and artwork. “You see that?”, he asked, pointing at the artwork on the wall, “The hummingbirds shadow on the rock is in the shape of an eagle.” There was my first payoff in my conversation with Dan. That was new to me. Eel River Brewing’s head brewer, Matt Vivatson arrived and began chatting with who I think was his girlfriend (Stranger #2) and after a while, I rudely butted in to ask him some questions about the beer. Matt happily obliged to answer some questions. The next day I caught up with Dylan Schatz, head brewer at Mad River Brewing Company. He took a few minutes out of his brew day to sit down and talk with me. I asked Dylan if he minded if the recipe went public. He declined, citing that he was really just one of the collaborators so it wasn’t up to him. I honored his request and intentionally left out some key information in repeating the recipe here. So the history making collaborative brew has hit the rough and tumble streets of Humboldt County. Every participating brewery is serving it, as well as The Local Beer Bar and Blondies Food and Drink. (as reported by the press release) It has also been learned since then its at Big Petes Pizzeria and they now have $2 pint nights on Wednesday. Get it while it lasts and start dreaming of the next collaborative brew of the Six Mad Lost Red Eels. HUMBOLDT, CA–For the first time, all five Humboldt County breweries recently came together to create a collaborative beer: Saison Du Humboldt. The beer was crafted by brewers from: Eel River Brewing Company, Lost Coast Brewery, Mad River Brewing Company, Redwood Curtain Brewing Company, and Six Rivers Brewery. It will be unveiled at HumBrews in Arcata on Monday, May 14, to celebrate the kick-off of American Craft Beer Week. The idea for the collaboration was born when Meredith Ripley, co-owner of Six Rivers Brewery, was with Mad River Brewing Company’s Brewmaster, Dylan Schatz, and Sales and Marketing Coordinator, Tera Spohr, at the Great American Beer Festival shortly after the two breweries released Wee Heavy Ale collaboratively, in honor of Mad River Brewing Company’s anniversary. “We were talking about how fun it would be to get all the breweries together and brew a great beer in honor of American Craft Beer Week, which runs May 14-20. 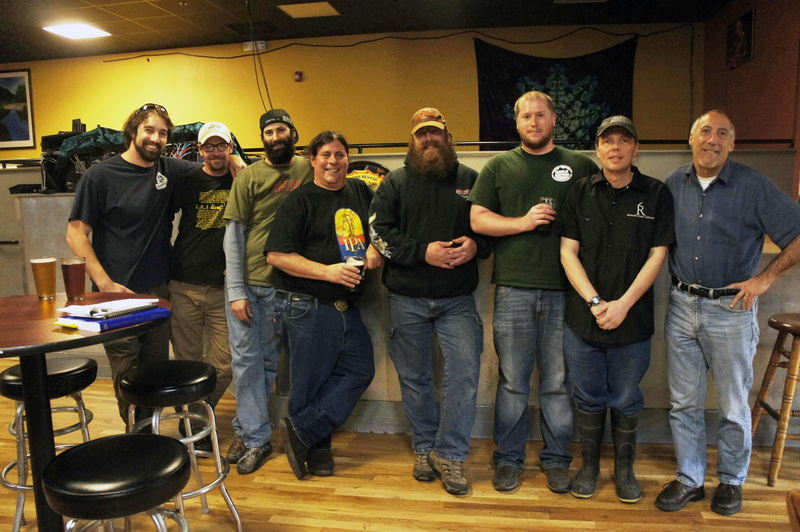 I put the idea out to the rest of the beer gang in Humboldt and everyone quickly agreed,” said Ripley. Next, all the brewers met to discuss the style of beer to make and formulate a recipe. 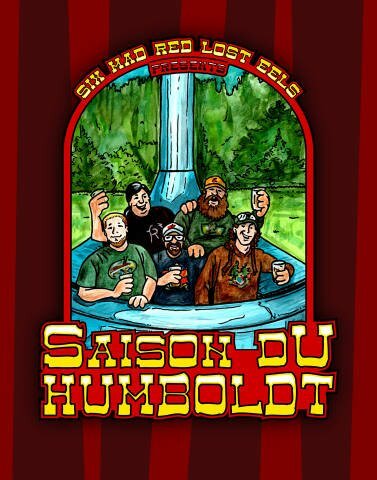 They decided on Saison Du Humboldt, based on the Saison style of a sometimes slightly sour, refreshing, and somewhat strong summer ale (5 to 8 percent ABV). “As far as we know, this is the first time such a brew has been collaborated on by five separate breweries. The brew day was quite an event and meeting of the minds among five brewers, each doing their part. I hope it brings the same joy and merriment to all as it did for all of us,” said Carlos Sanchez, brewmaster of Six Rivers Brewery. The brewing group has fondly dubbed themselves the Six Mad Lost Red Eels to incorporate the name of each brewery and hopes to make the collaboration an annual event. 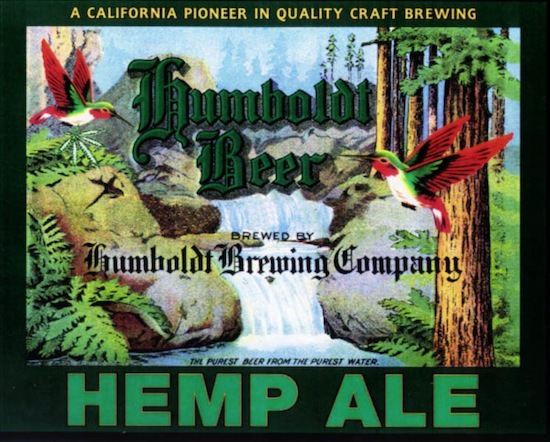 “I personally would look forward to making a Humboldt Collaboration brew an annual event for American Craft Beer Week, with each edition being a different style every year. This project was great fun and very inspirational to all who participated. We have an amazingly brilliant collection of brewing minds in our area, and it has been a true pleasure to work together with everyone involved,” said Schatz. Saison Du Humboldt, a one-time edition, limited production run, will be on draught at Humbrews starting Monday, May 14, for the kickoff of American Craft Beer Week which started in 2006 as a national celebration of America’s small and independent craft brewers and their impact on American culture. Saison Du Humboldt will also be available while it lasts at each participating brewery, Blondie’s Food and Drink in Arcata and The Local in Eureka. PHOTO: The Six Mad Lost Red Eels (L to R): Drake Mollberg (Redwood Curtain), Matt Walsh (Lost Coast), Mike Lisignoli (Six Rivers), Carlos Sanchez (Six Rivers), Dylan Schatz (Mad River), Matt Vivaston (Eel River), Jon Hill (Six Rivers), Briar Bush (Lost Coast).